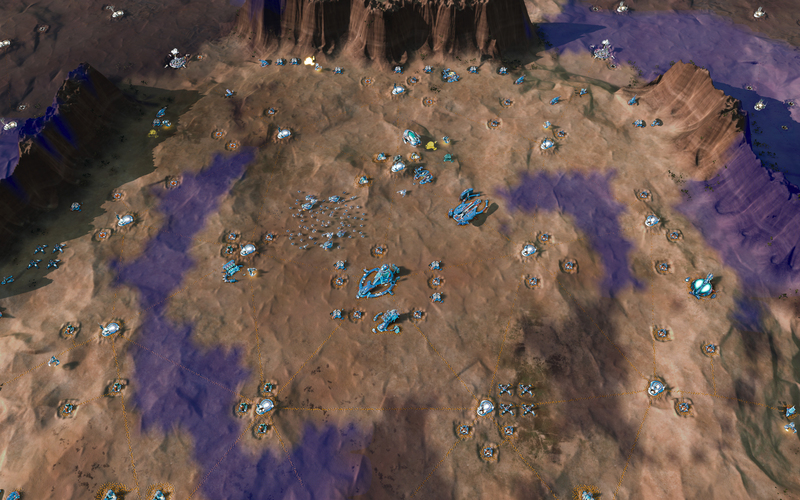 Stardock has revealed the first expansion pack for its massive-scale RTS, Ashes of the Singularity. Escalation lets you take your war to the next strategic level on huge maps, destroy your enemy with devastating orbital abilities, bolster your armies with unique new units, and much more! See Haalee's point of view and learn about the origin of the Substrate in the campaign "Memories." Experience the next chapter in the "Escalation" campaign as the PHC faces external and internal threats. Travel to new Crystal and Lava worlds for new and exciting scenery for truly epic battles. Wage war across landscapes of massive crystal formations or storm your enemy's base across spans of volcanic pits and burning terrain. 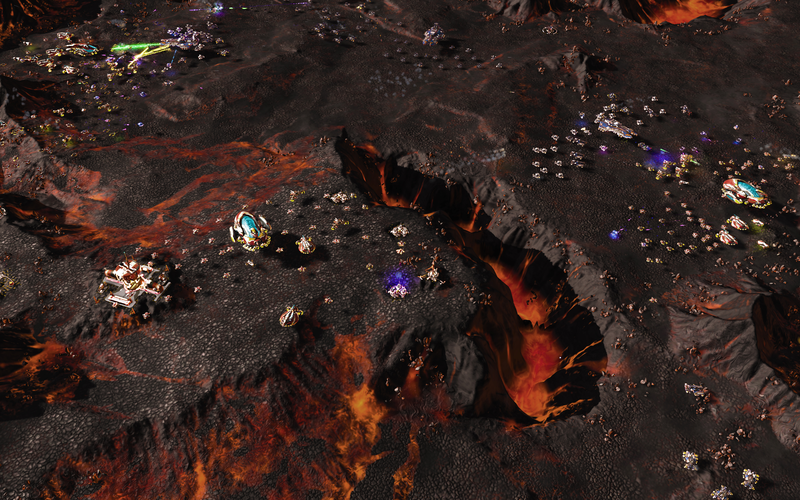 Bolster your defenses with new upgradeable buildings. Unleash devastating advanced aircraft units on your enemies by building an Aviary or Advanced Sky Factory. Lay traps for your enemies or surprise them from behind enemy lines with new offensive and defensive turrets. In Ashes of the Singularity: Escalation you will take your war to the next level and engage in massive battles. Escalation is $19.99 for existing Ashes of the Singularity players and will be $39.99 for new players. The conflict is rising - are you ready to wage a massive war? 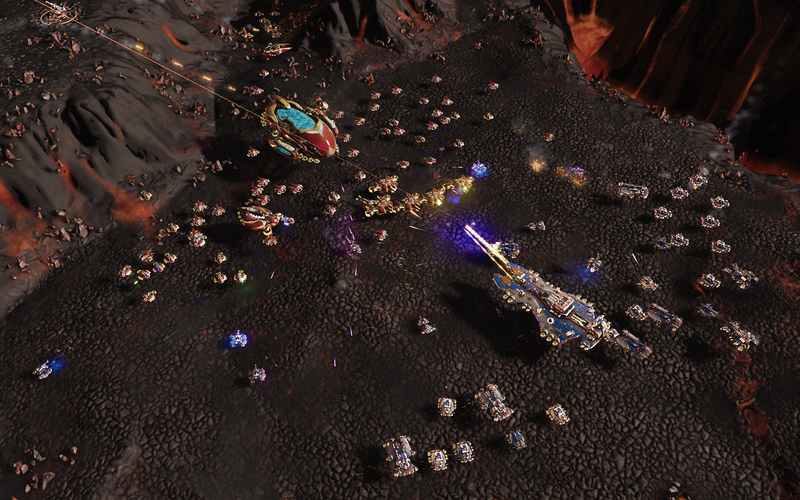 Ashes of the Singularity: Escalation will be available for pre-order on August 25th. Yeah. This looks awesome! Fantastic that the game is kept alive with updates and dlc etc. If I buy Escalation can I gift the base game to a friend that doesn't have it? Seeing as a founder I'm paying teh same price as everyone else that might be the only way I would consider not just waiting for it to come on sale. And then add strategic zoom and 16 player support as free features added. So instead of there being $30 of new DLC it's a $19.99 expansion for Ashes players. I just logged out of my steam account to check steam pricing. Escalation is $29.99, and it comes with the base Ashes game, as far as I know. So essentially, if you're a new player, you pay $29.99 and get Escalation + Ashes (full experience). Now, you can alternatively buy the Ashes base game at $13. If you do so, I believe you can then purchase escalation at $19.99. This would be pretty silly, since it would cost you ~$3 more than just buying escalation. I guess the benefit of this package is that you might get to play Ashes for a few weeks, until escalation releases... A $3 value, apparently. (Actually, I'm not sure whether purchasing escalation actually gives access to Ashes immediately. I am wondering if this really makes sense, and would certainly recommend a price adjustment of the base game down to $10, so that buying piecemeal doesn't punish you during the sale). The third possibility -- which includes me -- is that you already own Ashes. If you already own Ashes, you probably bought it for either ~$40 or ~$20. If you're in this category, lucky you. For the same game experience of Ashes + Escalation, you will have paid even more. They're the luckiest of all. I guess I'm just saying that, while I understand the company needs to break even (at least), this doesn't seem like a terrific way to go about the pricing. It punishes the people who jump on board early and stay loyal. I realize that there are costs to software production, but this is quite a bit of variation in a matter of months. And the game is still buggy and undergoing improvement. Maybe consider some extra DLC or something to even the score? Frogboy: Seriously. I hear you. Perhaps now is your chance to give something away. A couple points on that. The Ashes Lifetime Founders get all this for free. They're the ones who paid $99. We are still meeting on what we can do to thank our most loyal customers. Trying to make people happy ultimately ends up with making some people unhappy. Some of you who have been here a long time saw all the grief we got because our games used to have players create a Stardock account on first run. I'd explain to them on these very forums that the reason we did that was so that we could make special offers to those users because they're in our system and we know when they bought the game. But the overwhelming demand was that we get rid of the activation. Even Sins doesn't have it anymore. So now we have no idea when someone bought a given game unless they bought it from us. So that means, just the Founders. So at least we can still do things for them (like give upcoming DLC to them). But that will only make those who purchased day 0 annoyed. In other words, there's no way to do something that doesn't upset some people. Any hints on types of defensive structures that are coming in the expansion? Push something through steam to all current ashes owners. Everyone who already owns the game gets this one. As long as you purchase before Sept 30. I would have become a founder if it was still open. I would do it in a heartbeat. My rig wasn't setup to handle Ashes when it was released. I needed to upgrade ram and video card. Wasn't even sure if it would run until I got the game going. Now that's an idea... give existing ashes players the belated opportunity to become founders. Call it "followers" or "converts" or "loyalists" or something. That's the kind of mindset that is likely to make people hate (Read some Total War - Warhammer reviews related to pricing policy). You are not selling groceries to put a price tag on each and every feature. You are selling an experience which although has a fascinating core idea is getting developed at a slow enough pace to make me lose interest and consider whether this game worth my time or I should find a better value proposition. Being part of the community for ~5 months and witnessing the rather low % of problems solved, constructive criticism being overlooked and implementing blunderous balance changes makes me consider in depth any future purchases of Stardock content. Instead of trying to justify price with development cost of units,maps, buildings and whatever - give a proper editor and watch community members create content for your game. That way maybe this project won't die or remain marginal. I think they are doing pretty well. I have seen at least one of my issues fixed, and I'm glad it was. It made the gameplay experience much better. They've done quite a lot of bug fixing, if you haven't notice. Game doesn't crash anymore, really. That way maybe this project won't die or remain marginal. Oh whatever. They're doing a great job. I personally just have bones to pick about the pricing atm. ^ I don't understand why there such slow reaction on some of obvius balance problems. I mean sure things need to be tested, but why not pick number of top players interesting in helping solving balance problems, create test branch of game where devs can test balance changes along with those top players? We don't know when someone purchases the game. That is precisely how the issue happened in the first place. We thought we could simply sell the expansion to people for $14.99 who had already bought the game before the sale. But you can't. The only people we know the date they purchased are the founders. Everyone thinks every game has balance issues. The StarCraft forums are full of people who insist the game is horribly balanced. There is no balance in MP that will satisfy the player who has lost in multiplayer. There will be people insisting Ashes is unbalanced 10 years from now. People today insist Sins of a Solar Empire is totally unbalanced. Balance is a never ending struggle because it's so subjective. Anyone can look at the accumulated change logs in the past 5 months and recognize the game has a very brisk development pace. If there's another RTS out there that you think is evolving faster than Ashes, you should, by all means, play that game. Oh what a surprise... perhaps that the reason why top players should be helping with balance and not some forum randoms? If there was other RTS in same segment i would gladly do that. Not having competitors doesn't justify anything. Oh and sadly I'm not talking about "technological" part of AoS. But rather game play, setting and style. Here's the problem you face: We don't agree. You insisting you're right is not persuasive. I have played competitively for years. I am running with rather high win % in Ashes. I do not come to the forum writing with bitterness about imbalance that lost me a game I should have won. Your statement only strengthens my impressions so far that giving feedback on the forum is generally ignored and likely considered "a guy that just lost a game is blowing steam off". I have a request. Please delete bots queue for legendary rank! It's annoying. BTW I bought the escalastion exp, game is good and deserves to be supported. Nope, not gonna by this game again. I am already a founder level for this game. Now I have to buy an expansion? I understand the need to make money but this seems a slap in the face of founder backers. Sorry will not be purchasing this one, I will just wait 6 months until you discount 75% on steam. Very disappointed with the Stardock Team and are you guys ever going to fix Servo? I'm a basic founder too. Fortunately I am not buying the game a 2nd time, I'm just buying an expansion called Escalation for £15/$20, a pretty standard price for expansions. The only thing I'm really disappointed about is that I'm pretty sure I remember something when this game was first announced that the large maps would takes hours to cross. Kinda lame you have to pay for larger maps now. I am sure that top players on MP can make the game more balanced for tiny and small maps that are designed to be completed in less than 30 minutes for the 2.4% of the player base that plays multiplayer. And we do regularly issue balance updates based on listening to feedback. But it would be folly to try to balance the entire game around that. 1) I'm not going to get upset about $20 vs $10. That's silly and I'm wasting my time if so. Stardock dialogues with its players (which doesn't mean they do what we say). Their DLC is fairly priced and isn't from pulled features (hello Total War). 2) If you bought the original Ashes for $40 (or $X) then you were happy to pay that price at the time. I bought a pair of headphones for a $120, three weeks later they were $100. Big deal. And I got to use them for 3 extra weeks. 3) The game seems well balanced to me (while it's a moving target). 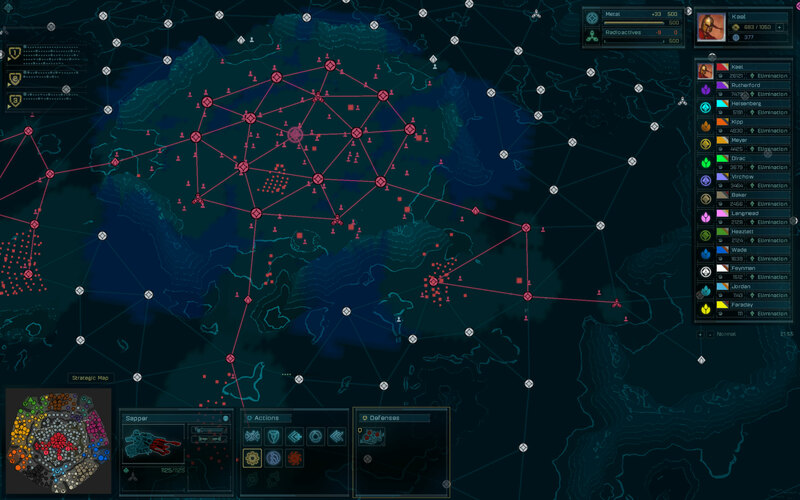 Most strategy games are boring (not just RTS) because there is really 1 way to win. In Ashes I've won/lost with multiple strategies. There isn't 1 answer. And my favorite part? It's not about micro!